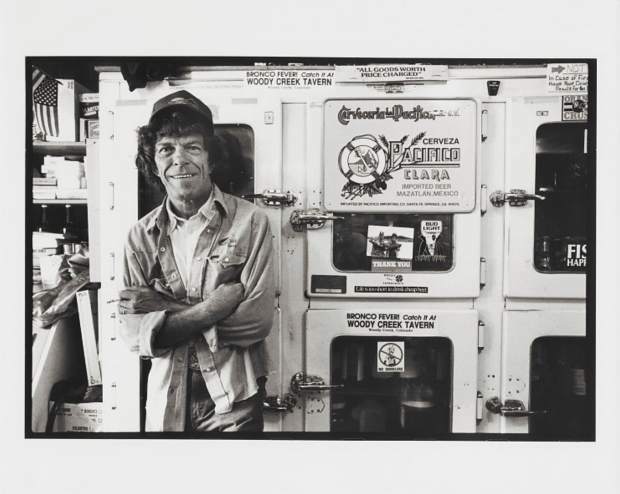 I took the portrait of Gaylord in front of the cooler at the Woody Creek Tavern in 1988. It was an assignment for one of the local publications. I had contacted him to set up a date and time for the photo session and he was less than enthusiastic about the prospect, but I tried to assure him that it would be basically a painless process. After a bit more grumbling he agreed to meet me at the Tavern on the agreed upon date and time. I got to the Tavern the morning of our agreed-upon date and I was a little bit early in order to scout out some suitable locations. After several minutes, I took a seat at the vacant bar and had a couple cups of coffee and talked to the bartender. After I told him I was there to get some portraits of Gaylord, he replied that I shouldn’t be surprised if he didn’t show up. After an hour and a couple more cups of coffee, I assumed the bartender was right. Gaylord wasn’t going to show up. Later that day I called Gaylord and he told me he had forgotten and agreed to meet a second time. Again, I showed up a little early for our session and had a cup of coffee at the bar. The bartender advised me that Gaylord had been there the night before, drinking with some friends who kept buying him more shots and beers and he stayed well past closing time. Once again the bartender warned me that he probably wouldn’t show up. After waiting for about 30 minutes, I figured he was right and I left. I wanted to photograph at the tavern in the morning as it wouldn’t be crowded and I would pretty much have free reign to set up locations in and out of the Tavern as I wished. But, after two attempts I was beginning to realize that Gaylord probably didn’t function all that well in the mornings. But, I tried one more time to set up another session, he agreed to meet me and he did! I was successful in getting a portrait that the publication used in its story about Gaylord. A copy of that portrait was stuck in the front of the Tavern cooler for many years and as far as I know it is still there. Gaylord definitely went with the beat of a different drummer and it definitely was not the beat of a photographer with a deadline to meet. That was my agenda and not his. It was just Gaylord being Gaylord. He was a kind, respectful person who would treat you honestly if you treated him with honesty and respect. He was a fun guy to be around and could deliver hilarious and snarky daggers whether talking about the Aspen scene, local or national politics, or the Broncos. His kind will not occupy a seat at the Woody Creek Tavern ever again.